Christie® is pleased to announce that Suning Cinema, owned by Chinese electronics retail giant Suning Commerce Group, has deployed its state-of-the-art cinema projection systems in two newly opened multiplexes in Nanjing and Xuzhou to offer movie-goers the ultimate 3D viewing experience. The luxurious 13-screen Nanjing Suning Cinema has been equipped with Christie CP2208 3DLP® digital cinema projectors capable of displaying DCI, 3D, High Frame Rate (HFR), alternative and local content. It is the cinema chain’s first multiplex in the city to feature VIP screening rooms, concierge services, and customized events for discerning patrons seeking a new movie-going experience. Xuzhou Suning Cinema, on the other hand, is a meticulously-designed multiplex made up of eight screens and 1,500 seats that caters to patrons of all ages. At the heart of this facility is the advanced Christie 6P laser projection system installed in its flagship auditorium boasting an 18-meter screen and 260 seats. The system comprises Christie’s scalable laser illumination platform, consisting of a Christie Freedom 6P RGB laser projection system with rack-mounted laser modules producing the brightest images, the purest colors and the best 3D movie experiences. Other auditoriums in the multiplex are fitted with the Christie Solaria™ Series CP2220, CP2230 and CP4230 digital cinema projectors. Christie’s strategic partnership and Suning Cinema has seen the burgeoning cinema chain installing Christie cinema solutions in its multiplexes located across China, such as Shanghai, Zhenjiang, Anshan and Baotou. These include the award-winning RGB laser projection system comprising 6P and enhanced wavelength diversification configurations. 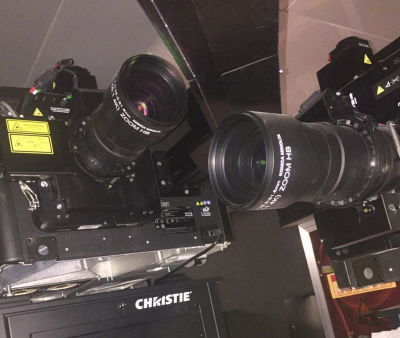 Christie’s pinnacle projection technology has seen widespread adoption due to its 4K resolution, high frame rate capabilities, a color gamut that exceeds the DCI P3 color and replicates the Rec. 2020 space, scalable light source up to 60,000 lumens, long operational and stable life (30,000 hours to 80% brightness), and built-in redundancies for improved reliability. With over 85 years of experience in cinema, Christie is the industry’s preferred cinema solutions provider. The company has accumulated a unique wealth of knowledge and experience with the completion of more than 48,000 installations around the world and over 10 million screenings so far. As the industry evolves, Christie is committed to ongoing innovation to meet the changing requirements of filmmakers, production houses and exhibitors, as well as audience demands for epic cinematic experiences. These include the world’s first commercial high brightness 4K RGB laser projection system in Shanghai in 2014, and the screening of Director Ang Lee’s Billy Lynn’s Long Halftime Walk in 4K, 3D, 120fps at 28fL in 2016.